KRIMPEN AAN DE IJSSEL, Netherlands (JTA) — For two years, the world’s only seaworthy life-size replica of Noah’s Ark has been wowing passengers traveling along Holland’s Maas River. Built according to the specifications detailed in the Hebrew Bible, the 390-foot-long vessel towers to a height of 75 feet. It boasts enough wood to fell 12,000 trees. And its distinct form dominates the coastline of the small town hosting it deep in southern Holland’s so-called Bible Belt. Dwarfing even some modern-day cruise ships, the ark instantly became an international tourist attraction when it was completed in 2012 after four years of construction. But the man who built it, the devout Christian businessman Johan Huibers, can’t wait to take the mammoth to Israel — a country whose problems and successes, he said, are always on his mind. “My preferred destination for the ark is Israel,” Huibers, 60, told JTA earlier this month on the forward deck, which features a life-size statue of a giraffe. His love for the Jewish state and people, he said, flows from the same impulse that compelled him to raise nearly $5 million to build the ark. Huibers planned to take the ship to Israel soon after its completion, but wildfires in Israel torpedoed the journey. 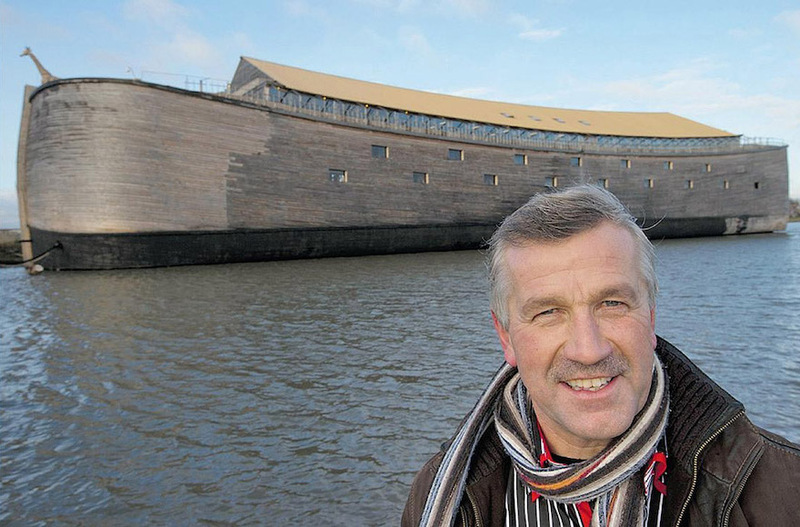 Now he no longer has the approximately $1.3 million necessary for getting there (the ark has no motor, so Huibers needs to rent tugboats to sail it). Huibers had plans to sail the ark to Brazil, but those fell through, too. But Huibers, who made a fortune building storage spaces, wants to be listened to. He built the ark, he said, “to show people that God exists.” The ark, which Huibers said he built with just seven people over four years, proves that Noah’s Ark could indeed be built by that biblical figure. “I wanted children to come here and feel the texture of the wood, see the nails and see that what is written in the book is true,” he said. In the Bible, God warns Noah, a righteous man, of an approaching flood. He instructs Noah to build the ark with his family and collect pairs of animals so they may survive the deluge, which was meant to cleanse the Earth of the sins of humankind. By contrast, Huibers got the idea to build an ark from reading a story about it to his children after supper one evening in 1993. Huibers’ daughter, Deborah, excitedly relayed the news to her mother, Huibers’ wife, who is a police officer. But it drew little more than an incredulous chuckle from her. “She told the kids that after I finish building my ark, we can all go on vacation to the moon,” he recalled. Thirteen years later, Huibers completed his first Noah’s Ark replica, dubbed “Johan’s Ark” by the Dutch media. It was only 230 feet long and 33 feet wide because those were the maximum measurements for any vessel seeking to negotiate Holland’s extensive network of canals. Huibers isn’t the only one using the ark to prove the probability of the biblical story. In 2016, Ark Encounter, a creationist theme park featuring an ark built on a biblical scale, opened in Kentucky. But unlike Huibers’ boat, the one in the landlocked state does not float. The Kentucky ark was built with more than three times the budget of the one in the Netherlands. Huibers said his crew was made up of amateur carpenters without real training, adding to the overall authenticity of the vessel. The ark is currently closed to visitors because of disagreements between Huibers and this municipality. Krimpen aan de Ijssel officials say they favor reopening it but require “certain adjustment,” citing public safety concerns. Huibers said the ship is safe, insured and equipped with better fire extinguishing equipment than required by law. When it was open to the public, the ark had a small petting zoo, of which only an aviary with parakeets and other small birds remains. Huibers said he does not intend to place living animals in the ark for now, “only to show they could fit.” The boat features stalls, larders and internal gutters for the disposal of refuse. In addition to wanting to give schoolchildren a tangible experience of Noah’s Ark, Huibers had darker reasons for building the two wooden vessels he has made. Growing up in a low-lying country whose population has been fighting back water for more than 1,000 years has given Huibers a better understanding than many of the risks of flooding. He was born five years after the North Sea flood of 1959, which killed more than 2,000 people in a society still crippled by the devastating effects of World War II. The ark, though, isn’t designed to save Huibers’ life or family, he said. In case of a calamity, Huibers does keep a few boats for his family, he said, noting that one of them can hold 100 people. “Maybe we’ll end up saving the neighborhood one day,” he said.